Time to sell your Moonraker condo? Read about today's resort-market condo buyer. 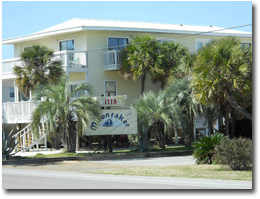 Moonraker condominium is located in the West Beach area of Gulf Shores, Alabama approximately one and a half miles from the intersection of Highway 59 and West Beach Boulevard. Moonraker is comprised of 39 individual condo units built in 1980. Moonraker has a community pool and some of the condos in the building have views of the Gulf of Mexico while other condos have indirect Gulf views. The building has deeded beach access, covered parking, and is in a great location close to restaurants, shopping, and entertainment venues. Moonraker is composed of one- and two-bedroom units ranging in size from 400 square feet to 700 square feet. Moonraker offers a great opportunity to buy a place at the beach at a bargain of a price. If you have any further questions, need info or would like to schedule a private viewing of Moonraker condominium in Gulf Shores or any other condo or property, please email info@condoinvestment.com or call (251) Area-Pro (251-273-2776) for immediate assistance. Planning to rent your condo? Read our RENTAL TIPS to help increase your Moonraker rental revenue. Additional info for rental revenue numbers for Moonraker and all other Gulf Shores condos.